Many are asking Are Mortgage Rates on the Rise? Within the last month major Banks and other lenders have been slowly increasing their fixed term mortgage rates, and many people in Canada have been asking are mortgage rates on the rise here in Canada. What most consumers don’t know about their question of ‘are mortgage rates on the rise’ is that as the cost of doing business goes up so too does interest rates. One example of this cost is the purchase of bonds. 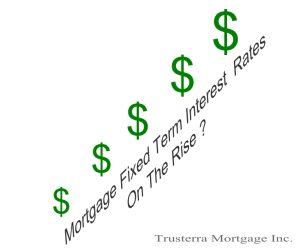 As the prices of bonds increase so too potentially does the interest rates on fixed mortgage rates. Another question one can ask is are mortgage rates on the rise on the variable side of the mortgage industry? The answer to this question is that for the time being they are staying put. Variable rate mortgage rates are based on the Bank of Canada prime rate and what it charges financial institutions to borrow money from it. The Governor of the Bank of Canada has hinted — see the press release here — that for the short term the Bank of Canada will not be raising rates.